Financial preparedness after retirement is important. Your actions and decisions for present will bring impact your future. To ensure safety and growth of your investments, fixed deposit is one of the best investment instruments to secure your future as a senior citizen. You can use FDs in multiple ways to ensure your financial security. Moreover, as a senior citizen, you can avail special schemes and rates on fixed deposits in Finance. Apart from safe principal amount and high returns, FD also gives you the benefit of easy management, and flexibility to choose investment terms as per your requirement. If you still haven’t decided on investing in FD, then you should consider Senior Citizen Fixed Deposit Scheme from Bajaj Finance. Let’s see why senior citizens should make this decision. What Do You Get When You Invest In Bajaj Finance Fixed Deposit? Senior Citizen Fixed Deposit from Bajaj Finance is a secured investment plan that provides high returns. As a senior citizen, you get the advantage of higher interest rates (0.35% higher than regular fixed deposit interest rates). Interest rates can go as high as 9.10% which is one of the highest in India. You get the best return on maturity when you invest for long-term. It is easier to fulfill all your post-retirement dreams with wise fixed deposit investment plans. A sound financial investment plan is also a source of constant income. 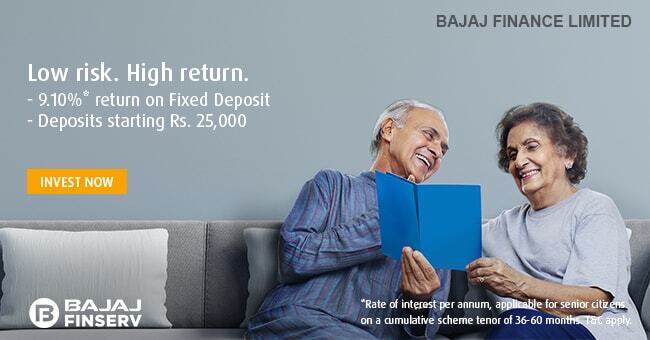 Bajaj Finance Fixed Deposit lets you build a retirement corpus to meet all your needs. FDs are unaffected by market risks, unlike mutual funds or shares. It’s the safest bet to invest in FD as there is no risk. You will get the amount you are entitled to. You can always calculate the maturity amount with the help of easy-to-use online FD calculator. You can divide your investment amount across different tenors and different interest rates. This will help you benefit from the power of compounding and also offset the effect of inflation. These deposits are highly liquid and can be withdrawn anytime before maturity. You can even raise a loan against FD at a lower rate of interest in times of financial emergencies. Why Only Bajaj Finance Fixed Deposit For Senior Citizen? Bajaj Finance’s minimum amount for FD is INR 25,000. So you can start investing in Bajaj Finance fixed deposits (FD) with a nominal amount of INR 25,000. The rate of interest can go up to 9.10% for senior citizens, which is the highest in comparison. Bajaj Finance Fixed Deposit offers great convenience in terms of account opening, renewals, tracking, and management. Online application facility and online account management via Experia help you operate your FD account at the tap of your fingertips. It is also highly credible. It has ICRA’s MAAA (stable) rating that makes it the most reliable option to invest in. It also has CRISIL’s FAAA/Stable rating. With a non-cumulative FD plan from Bajaj Finance, you can avail periodic earnings on your investment. You can choose the frequency of the interest payouts (monthly, quarterly, half-yearly or yearly) depending upon your financial requirements. Periodic earnings are a good source of income for senior citizens. With periodic earning options, senior citizens can meet their daily expenses like healthcare, rent, bills, insurance, and other payments. Bajaj Finance Fixed Deposit offers a flexible tenor of one year to five years. If you invest in a five year fixed deposit, you will get a good return on investment. Aisha is a passionate blogger. He has expertise in writing finance articles. He have been serving society as a financial adviser. He loves keeping himself up-to-date with the news and happenings around. He is always open to learning and shares his experiences on his Greetings of the Day.